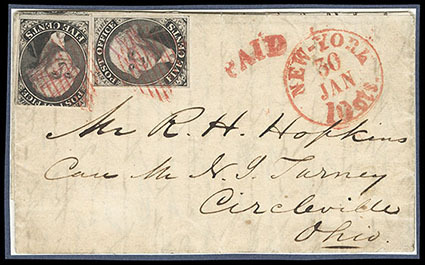 New York, N.Y., 1845, 5¢ black on bluish, four large margins except close at left, part of adjacent stamp at top, tied by blue manuscript strokes, red "New-York 2 Feb" cds and "Paid" arc handstamp on 1846 blue folded letter to New Haven Conn.; light stain spot, F.-V.F. Scott No. 9X1; $600 Estimate $200 - 300. 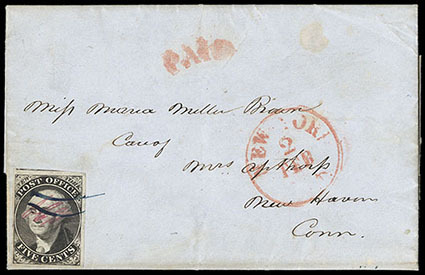 New York, N.Y., 1845, 5¢ Provisional Collection, collection comprising 9X1 Sperati signed die proof, 9X1d forgery, 9X1 regummed with large margins, three Rawdon Wright & Hatch banknotes showing the same stock Washington vignette, 9X1-E1a in blue on India off-card, 9X1 on folded letter to Dundee N.Y. cancelled by arced "Paid" handstamp and tied by red square grid; and 9X1 (2) tied by strikes of red square gird on folded letter to Circleville Oh., also includes several letters by R.H. Morris including three 1845-47 on Post Office letterhead, 1848 letter with original free franked envelope, 1843 free frank as Mayor of N.Y., 1845 printed New York post office info and rates excised from larger NYC directory, and two 1853 ALS letters recommending Democratic candidates for a customs and inspector positions, F.-V.F. and interesting collection. Scott No. 9X1 Estimate $1,000 - 1,500.